Stewart’s Division retreats from Poe Field. General Brown is wounded, and command of his brigade passes to Colonel Edmund Cook of the 32nd Tennessee. 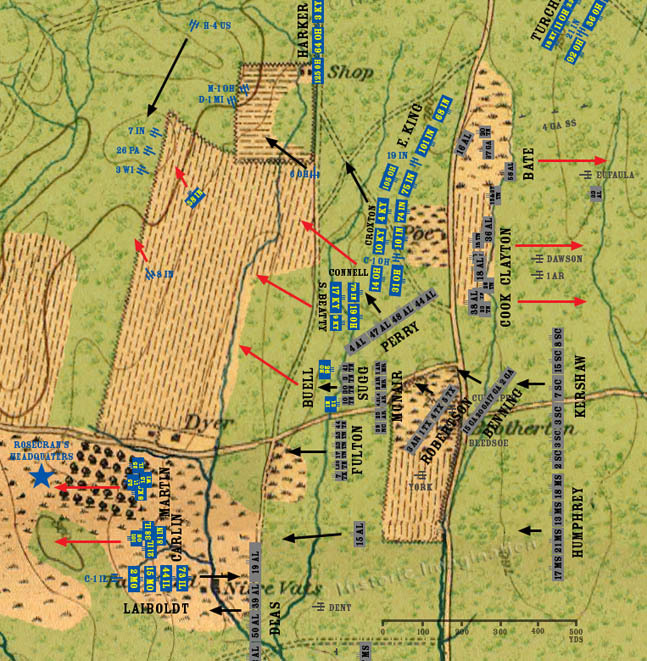 The 16th Alabama remains in the field fighting King’s brigade. Perry’s brigade smashes into Connell’s brigade and the already skittish troops of General Samuel Beatty. Both brigades rout and flee west. Colonel John Croxton attempts to pull back his brigade and re-orient it facing south. Sugg’s brigade attacks through McNair’s stalled troops, sending the remainder of Buell’s brigade fleeing to the west.